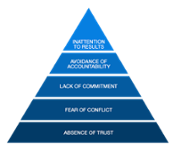 There are several options to help your team become more effective. This workshop helps leaders learn to apply the Five Dysfunctions model to improve the cohesion and functioning of their teams. This workshop helps teams reach a common understanding of what it means to be a team and make substantial progress toward becoming a more cohesive team.